Organizing Lives holds the Certified Relocation and Transition Specialist Designation and are members of the National Association of Senior Move Managers, both representing advanced training promoting professional standards of excellence within the Senior Move Industry. The numbers tell the story. The Canadian population aged 65 and over will jump nearly 80 percent as the Baby Boom generation retires (from 2010 to 2030). By 2030, the elderly will account for one-fifth of the total Canadian population. Today, many families are geographically dispersed and adult children are often not able to help with the moving process due to distance, career and family obligations. For family members living far away, the barriers may be geographic. Many seniors have no surviving children, or increasingly, their children are older adults themselves. If illness or death precipitates the move, the family is likely already drained both emotionally and physically. Senior Move Managers® Organizing Lives has filled these gaps to facilitate the transition for everyone involved. Older adults making a transition have usually not moved in 30, 40 or 50 years and need to downsize considerably. The organizational and physical tasks associated with planning and implementing such a complex move can be overwhelming for the entire family. 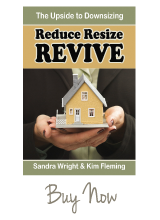 Meeting with you in your home and making a plan of how we will go through the process of downsizing together. Sort and organize your belongings to assist you in deciding what to keep, what to give family/friends, what and how to sell, what and how to donate and what should be discarded or recycled. Support you in the sale or disposal of the balance of your personal belongings. Preparation of a floor plan for placement of your belongings and furniture in your new home; determine what will fit before it’s moved. Prepare your home for sale in the real estate market by co-coordinating a team of trade professionals to enhance your home’s appearance, ensuring that you minimize real estate listing time and maximize your selling price. Manage the move to your new home.